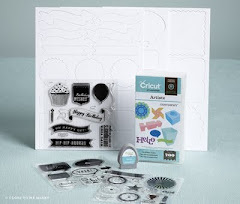 Crafty Happiness: Make-A-Plate Party Coming Soon! Mark your calendars! I am holding my annual Make-A-Plate party on October 20 & 21 at a friend's house. I bring all my stamps and inks and guests choose a design and stamp up a piece of specialty paper. Afterwards, I send off all the stamped papers to a company called Makit, Inc. Makit processes the papers into melamine plates, bowls and trays. It's a really fun craft night and the projects that are completed really turn out cute. 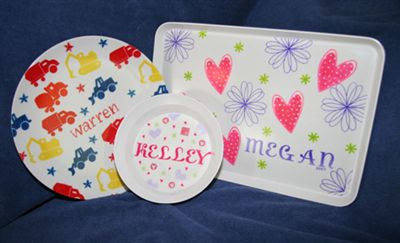 Most everyone makes personalized items for their kids. 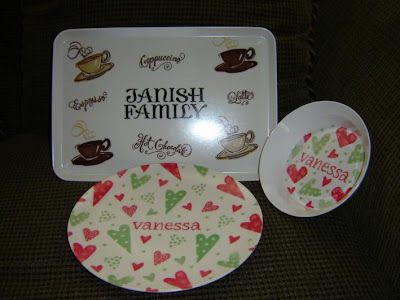 One of the most popular designs (although not pictured here) is a tray for Santa's cookies and milk on Christmas Eve. This is probably my 6th Make-A-Plate party, and there's always a big turnout. Let me know if you'd be interested in attending (if you're in the Houston area of course!). Your trays and bowls are SUPER CUTE!!! Just got your comment about the leg warmers. I'm pretty sure I could knit something up. Feel free to email me (nonapearl@firebin.net) and we can discuss the particulars.